"The idea of relating math lessons to racing came to me while I was playing with my three-year-old son," Tom Baughman told Education World. "We would race his cars down our driveway. After a while, we began to make bar graphs with sidewalk chalk to keep track of how each car finished. It was a lot of fun. I thought my students would enjoy using the cars too." A team of students takes measurements during NASCAR Math's car-testing phase. Photos provided by Tom Baughman. Although he admits that he isn't quite an "avid" fan of racing and that hes most likely to catch just the last twenty laps of a lengthy NASCAR race, Baughman recognized that the sport could make math more appealing to his fourth grade students at Friendship Elementary School in Glen Rock, Pennsylvania. Baughmans "NASCAR Math" activity has two main parts: car testing and the review race. "In the car testing phase, students are arranged into groups of three or four," Baughman explained. "Each group is given two or three 1:24 scale diecast cars and a packet of questions related to the cars. They use tape measures, compasses, protractors, inclines, geometry templates, and calculators to discover a variety of mathematical facts about each of their cars. 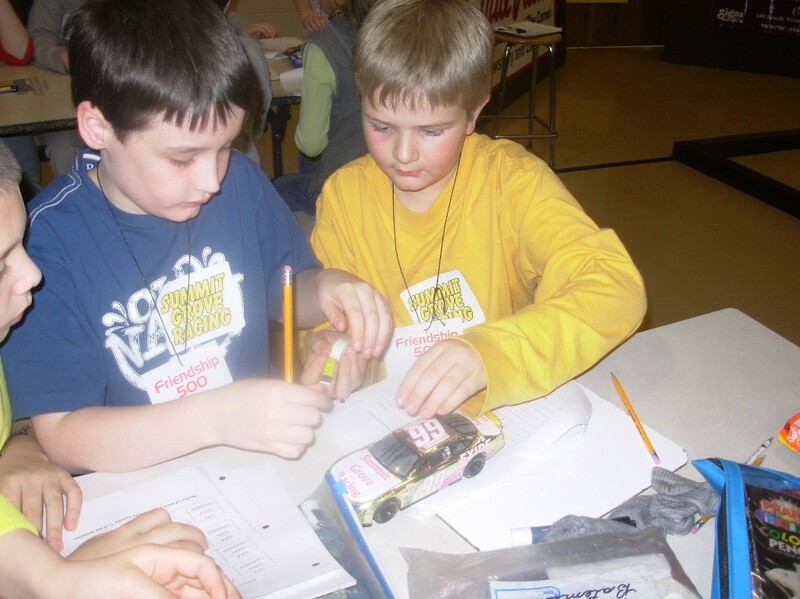 That information is reviewed by students to determine which car is their best entry for the race." A team works together to choose the best car for the competition. 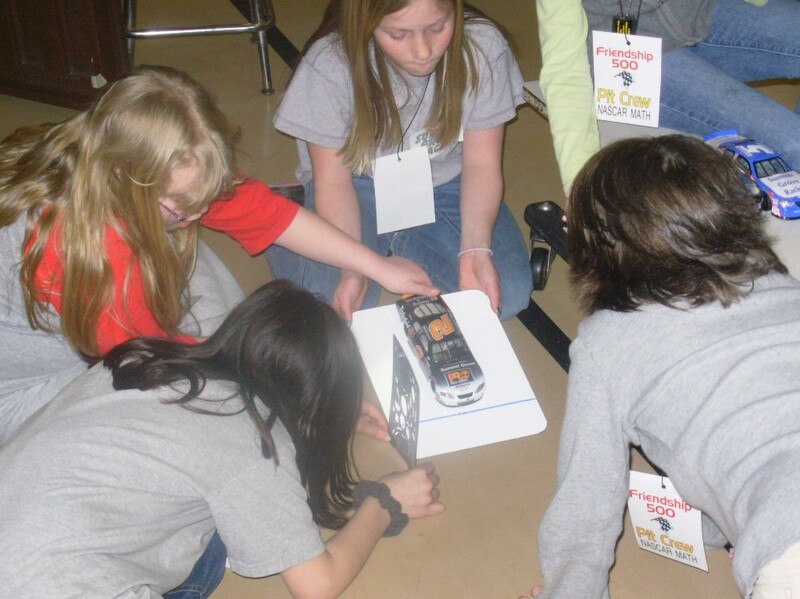 In the review race, Baughman's students place their cars on the start/finish line of a track on the floor. He asks review questions from the math unit, and the students write their responses with markers on whiteboards. If students respond correctly, their group moves its cars ahead. If not, they miss a turn. The first team to complete one lap around the track is the winner. 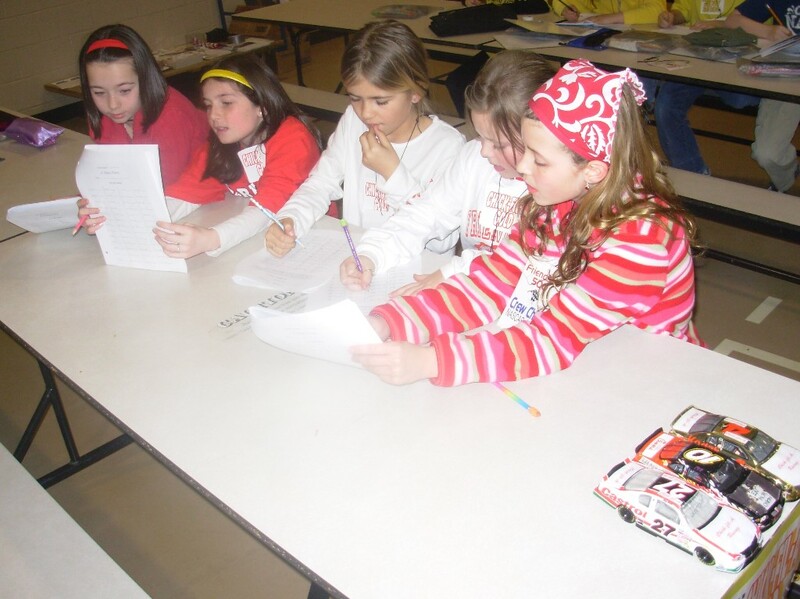 "Many students have told me that NASCAR Math makes learning fun," reported Baughman. "To me, that is the greatest success of the lesson. Students also are very supportive of one another because they realize that working together will produce the best results." Students support one another throughout the math activity. The young NASCAR enthusiasts in Baughman's class have received some very special attention. Driver Joe Nemechek sent autographed matchbox cars for each student. Darrell Waltrip talked to one class by phone. Joe Gibbs Racing sent autographed posters. Petty Enterprises and other organizations have provided cars for future lessons as well. "These connections have been very motivating and affirming to students," Baughman observed. "We've also had parents, grandparents, and local businesses donate cars and prizes. The amount of support weve received has been a pleasant surprise."